Composer/poet Hans-Joachim Roedelius (Kluster, Cluster, Harmonia) is one of the most prolific musicians of the German avant-garde and a key figure in the birth of Krautrock, synthesizer pop and ambient music. 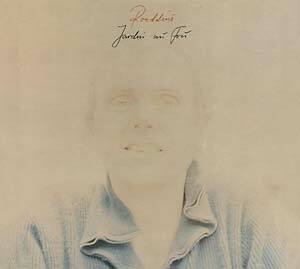 Jardin Au Fou is his second solo album, originally issued in 1979 on France's Egg label, and produced by former Tangerine Dream member Peter Baumann. This record was all the more noteworthy as it bore no resemblance whatsoever to what was expected of avant-garde electronica and displayed none of the typical Krautrock characteristics. A rhythm machine, sequencer and abstract sounds are conspicuously absent, and listeners at the time were stunned by one of the most beautiful, charming, ethereal and peaceful albums in the history of German rock music. None other than Asmus Tietchens, friend and artistic companion to Roedelius, has written the following in the liner notes for the reissue: "Jardin Au Fou (Fool's Garden) is a thoroughly romantic album, bursting with joie de vivre and unadulterated joy. With the greatest of pleasure, Roedelius cranks up a carousel of fairground organs, popping corks, waltzes and sweet melodies. Musical ideas come thick and fast. If you listen carefully and immerse yourself in Jardin Au Fou, you might hear traces of the baroque in this romantic music." Roedelius concentrates here on keyboards, and, in particular, the acoustic grand piano. He played most of the tracks by hand, exploiting his virtuosity to the full. The sweet disposition of the album as a whole borders on the naive, bearing none of the Krautrock hallmarks one might expect. Sweetness and light it may be, yet the music of Roedelius is more complex than it first appears. It carries a certain gentle gravitas borne of maturity, reflecting the ongoing quest of a musician for new paths and forms. Jardin Au Fou confronts the listener with an unfiltered, open perspective -- today, some 30 years after it was created, this music has lost none of its shine or charm. The CD version features 6 bonus tracks: 3 remixes of compositions from the LP and 3 new tracks which Roedelius recorded for the 1998 CD re-release on the Japanese Captain Trip label. The vinyl edition only includes the original album tracks.